Two American teenagers embark on a mission to track down the foremost expert on a powerful potion in this sequel to DeBruce’s YA thriller The Riddle of Prague (2013). It’s 1991, and Hana Silna, 18, is returning to America after a summer in Prague, where she reclaimed the family home for her mother (ill with a rare and dangerous blood condition) while battling ruthless forces in search of an ancient elixir that supposedly cures diseases and confers near-immortality. (She learned that those who use the rare substance “can die by fire, guns, drowning and other trauma, yet they’re immune to most maladies, infections and old age.”) In Prague, Hana met and befriended Alex Williams, a motorcycle-riding American who was also seeking the potion to save his sister, who has a fatal illness. As the sequel opens, Hana receives a flask of the elixir—but no clue how to use it, and a mistake would be fatal. One who knows the secret to handling the potion, as well as its source, is Valentina, a legendary Immortal. 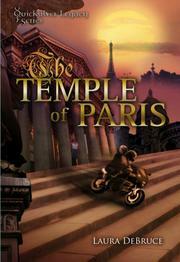 In Paris, Alex joins Hana in the hunt for Valentina by following clues left in a painting. Friends aid the pair—but it’s a race against time, because a threatening cadre intends to steal the flask, find Valentina, and force her to reveal the mysterious source. DeBruce again shows her talent for fast pacing and memorably eccentric characters, such as orange-haired dowsing detective Geerdina Singh: “I am Dutch by birth, Indian by marriage and a child of the universe.” Nadja, a Gypsy Immortal who was a mysterious character in the first novel, gets a fuller back story here; no longer just a shadowy nemesis, she reveals a deeply emotional side as well as intelligence and penetration: “He’s the type of man who likes to take up as much space as possible,” she thinks perceptively about a boorish American. But the Paris setting is less compelling than Prague, and many threads are left dangling at the book’s end, perhaps because it’s the middle volume in a planned trilogy. Not quite as exciting or satisfying as its predecessor, this novel still delivers an appealing continuation of the elixir story.